The blackbird with the aristocratic name! Not all blackbirds are mostly black. This Baltimore Oriole is orange! It’s named after Sir George Calvert, First Lord of Baltimore, whose coat-of-arms carried a gold and black design. 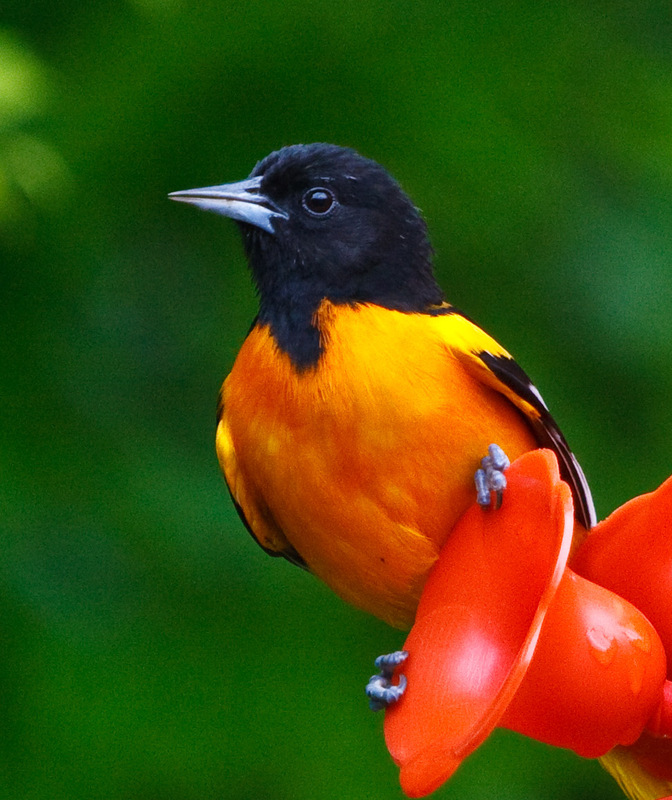 In spring and summer, you may see these orioles in the Midwest and eastern US, lighting up the trees where they nest. If you're lucky enough to live near Baltimore Orioles, entice them to your feeder with half an orange or some grape jelly. When I say the word, "blackbird," what sort of bird do you picture? Maybe the familiar Red-winged Blackbird that sings in the marsh? [Song of Red-winged Blackbird] Well, not all blackbirds are mostly black. One is orange and even has an aristocratic name: the Baltimore Oriole. This gorgeous golden-orange and black bird took its name from Sir George Calvert, First Lord Baltimore [heraldic music]. His coat-of-arms carried a gold and black design. 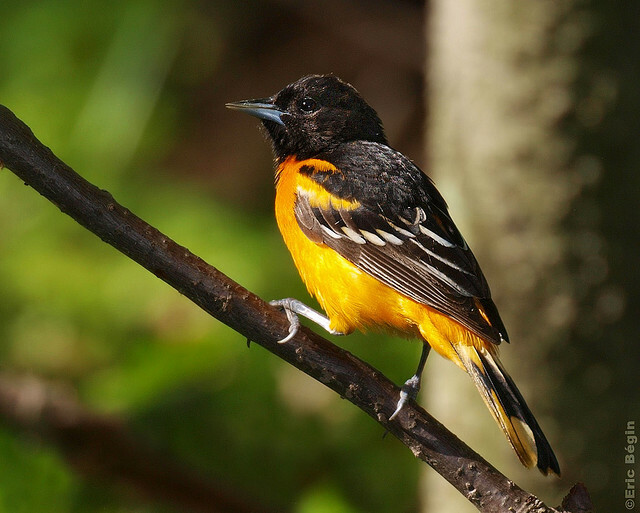 [Song of the Baltimore Oriole] Baltimore Orioles eat insects and fruit, but they're fussy. They go mostly for vividly colored fruit. For nesting material, on the other hand, bland is better. The female – who does all the …architectural work – bypasses colorful threads and fibers and instead chooses dull colors. She's a much drabber orange and blends in with the background while incubating her eggs. In spring and summer, you may see these orioles in the Midwest and eastern US, lighting up the leafy trees where they nest. * Per Laura Erickson, it's best to save the grape jelly for spring and fall migration, when migrating birds need the extra calories. Then, serve up a small amount in a small container, so that the birds don't get stuck. Thanks! Bird sounds provided by The Macaulay Library at the Cornell Lab of Ornithology, Ithaca, New York. Song of the Baltimore Oriole  recorded by A.A. Allen; song of Red-winged Blackbird  recorded by W.W. H.Gunn; call of Baltimore Oriole  recorded by R.C. Stein.